Merry Christmas! Today I wanted to share with you some thoughts on Christmas traditions — from 20 women, including myself. …wait, what are you doing online? Get unplugged and make some memories with your family! Visit Santa – while we usually work in one visit to Santa during Christmastime, this year we had two. Our “usual” venue was at the country club — see the snapshots of my two boys with their first visits with Santa. Such cutie pies! But the highlight, for my train-loving toddler, was our train ride to see Santa (we also made hot cocoa and cocoa salt dough train ornaments that same week). The Christmas Pickle – an ornament we hang on the tree, it’s shaped like a pickle. Whoever finds it is said to have good fortune for the year ahead. In my childhood, it usually accompanied a game of “I Spy” on the tree, with the room lit by the lights on the tree or by the fire. Orange in the Christmas stocking – we grew up with this tradition. I wasn’t sure of the origins, but according to the St. Nicholas Center’s Christmas Customs page, it’s representative of gold dowry. Oranges also used to be a scarce treat (read more about why we put oranges in stockings at Christmas. Set out milk, cookies, carrots, AND gifts on Christmas Eve – we grew up with the tradition of putting out snacks for Santa and his reindeer, but only since having kids did we add the “gifts” part. The boys select one toy for each year they are old, and Santa will take them to give to kids who don’t have any toys. I absolutely love this. Toby was so excited to give kids one of his fire engines, a fireman’s hat, a book, a well-loved stuffed animal, and a few wooden train accessories. It has been great to see him so focused on giving during Christmastime. Last year I wrote about the power of giving, and the toys that Toby decided to part with. That year, the tough one (for me) to let go was the Hello Kitty house. This year, it was tough for Steven — Toby decided to give some of his train table accessories (a building and a train engine). Isn’t it amazing how this exercise in giving helps everyone? Getting sick – this is one of those traditions that we wanted to put an end to. Last year, I learned about Christmas tree allergies and how they are usually due to allergens that are on the surface of the tree. So we took some measures to minimize our Christmas tree allergies this year. I think it’s working! Ok, well that’s all for now about our traditions — I want to share with you the 19 other takes on making memories at Christmastime. Read on for some fun insight on different family Christmas traditions! Click on an image below to enter gallery view mode. I have so many favorites! I think the kids’ favorite is that every Christmas Eve Morning we go bowling. Then we eat out for lunch and head home to get ready for a big ham Christmas Eve dinner followed by a musical program where we sing and the kids play christmas songs on their instruments. I love it because we are focused on family time and having fun together and there are no distractions from other sources. On Christmas Eve we [also] let the children open presents from their siblings. I like this because in the craziness of Christmas morning sometimes the presents from their siblings would be overlooked and not seem as special. When they open them on Christmas Eve, both the giver and receiver are more excited about it and they have time to give each other hugs and say thank you. It’s worked really well for us. My favorite tradition is our tree tradition. We go to a tree lot and pick out our perfect tree and then we come home and decorate it as a family while listening to Christmas music. We then bake cookies, and watch a Christmas movie while sitting next to the lit tree. TIS THE SEASON! We have two holiday traditions that I love. The first is simple- cutting down a Christmas Tree and our Tree decorating party the Saturday after Thanksgiving. First, we go cut down a tree. Then, we come home, and have left over thanksgiving dinner, fire in the fire place, and Christmas music while we decorate. The second is more spiritual, and it is our Jesus Stocking. Each year, our kids place money inside a stocking to help raise money for a charitable cause. It is our way of being the hands and feet of Jesus on His Birthday! For the last 18 years, we have had the tradition of inviting fellow military (single or families away from extended family), into our home for the holidays. Nobody should be alone. For Christmas, I put together little stockings with goodies, for each person to take home. For Christmas we wrap up 25 books and then the kids each get a fuzzy blanket. Starting on December 1st we unwrap one book a night to snuggle up and read for our bed time story. For Christmas we hang some of those HUGE stockings (you can get at the dollar store) with each person’s name on them. For the entire month we put little love notes, thank you’s, or treats in them for each other then we all open/go through them on Christmas eve. We also started doing only 3 gifts a few years ago and the kids loved it so we’ve done it since. They get 1 need (clothing type items) 1 spiritual gift, and 1 want (this is from Santa). The kids also have 1 of their siblings they get a gift for. Christmas eve we have 1 family gift that we open when we do our stockings, it has everyone’s jammies, hot cocoa, a movie, treats, book and those type of things to use that night. It’s been great limiting the number of gifts under the tree and making the focus on the true meaning of Christmas. We also make homemade tree decorations each year and try to do as much homemade type of gifts as possible. (Pinterest is GREAT for ideas) You can see my post on the ornaments we made last year! We LOVE celebrating Christmas!! Let’s see: we start Christmas Eve with opening one of our presents for one another, sing carols & usually bake plus a fun family movie. Each year we also forgo the big presents, stick to stocking stuffers (sometimes a few books & misc.) & go on a trip! We’ve been doing this for years. Last year we went up North (Ontario) & had a great time: snowshoeing, tobogganing down hills, caroling with a local church door to door and eating tasty food together! Last, but certainly not least, we already read/talk about the Christmas story (Luke 2) together during the holidays. Since I was a little girl, we had a box with all the pieces of our Nativity scene wrapped in newsprint. My dad would read the Bible story and we had to dig through the pieces to find the character he mentioned and place them in the nativity. It was a great tradition. We are doing something similar with our kids nows. When I was a child, my grandmother prepared a special Christmas brunch for my whole family. Each year she planned the menu for months! I started taking on the tradition by helping her each year. When she was diagnosed with cancer a few years ago I started to do more until I was making the whole meal. This will be our second year without her, but we carry on her tradition. Every year we purchase a new Swarovski crystal star ornament. Then when put them on the tree one by one and mention something about that particular year. The boys think it’s awesome to hear a snippet of our past years. We now have 13 stars and counting! We created a Christmas Advent activity to teach our children who God is and stll enjoy seasonal fun in December. It’s an ebook now: 30 Bible lessons and fun family activiities for the whole family teaching kids the character of God during advent. We have loads! I’ve got a whole post: Family Christmas Traditions (some crafty, some not). Each year we read some of the Christmas Classics and then do something related to the book afterwards. In the past, we’ve read The Nutcracker and then watched the ballet (at home on video or go to the ballet depending on the kiddos’ age). We’ve read A Christmas Carol, and then visited Dicken’s Christmas Village near us. Our kiddos are 7, 6, 5, and 3. Depending on their age, depends on what version of the book we read. We don’t celebrate Santa in our home, so we try to find things that are Non Santa related. To aid in our understanding of each of the books, I usually create homeschool unit studies (Nutcracker and Christmas Carol Christmas units). We also have our Random Acts of Christmas Kindness Tradition that is included on our countdown tree. The kiddos love it. I also set up dates with each of my kiddos to go Christmas shopping. I take them to dinner. They choose the place. Then I give them $10 for each person on their list-their siblings and parents. From there we go shopping together until they find a gift for everyone. Before we go they’re great at asking their siblings for ideas and making sure they know what their siblings like. They do this with Mommy and Daddy too. We have such a fun time. And while we’re out, I get great ideas for them for their stockings etc. Even though we don’t celebrate Santa, they still each get a stocking. Every Christmas we make homemade raviolis (around the 20th of December) and eat them on Christmas Day (and sometimes on New Years Day). We also bake cookies. On Christmas Eve was have the feast of the 7 fishes and try and have 7 different kinds of seafood for dinner (we don’t always get to 7 but we try and have a few different dishes). Because we have lots of extended family to visit we seem to spend much of Christmas travelling or not at home and it was getting a little overwhelming. So a few years ago we started a new tradition of Christmas breakfast with just our family. The kids love planning the menu, and we go all out with fancy breakfast treats we never usually eat and we spend time together eating, opening presents and spending time as a family. It’s lovely! What about you? Do you have any special Christmas traditions? Any you’re thinking of starting up? I’d love to hear from you in the comments! Snapshots tell so many stories, they take us back to a particular time and place. This snapshot is of me, my brother, and his friend as we were about to leave for school one day. In my car — my first car, my grandma’s car. My first car was nothing spectacular, but it was special to me. My grandmother had gotten it years before. I remembered riding in it when younger, and now I was driving it. A Chrysler LeBaron, it was the epitome of luxury, with velvety blue seats and upholstery inside of its white exterior. It was small, but a perfect fit. I drove that car for several years, until it was time to take a car to college and my parents decided it wasn’t “young” enough to handle the long distance driving. A fine car for around town — but not for across state. My grandfather “sold” me the car for $1 after my grandmother had passed away. He had no use for it, and wanted it to stay in the family to be used. And that it was. Used and cared for. I was and still am grateful for that gift-that-was-not-technically-a-gift. came to me through loss. my own chariot of the road. gave me freedom and responsibility. safely to and from school. route to get to school on time. the roads during our daily drives. my mother documented our departure. took a snapshot of us — and my car. Years later, the car is gone. A captured memory from everyday. but a piece of history. I’d love to hear memories of your first car, whether you had to save money to buy it yourself, or if a gracious family member passed an older car on to you. What was it like? Did it drive well? Do you have a snapshot of you with your first car? I love how the simplest of snapshots can tell an amazing story. More than “a thousand words,” pictures bring us back to the moment — they let us re-experience the sounds and smells that are so strongly linked to a particular memory. Today I want to welcome Cassandra of Raising Up Stones! She’s the mom of three kids, and has graciously provided me with this lovely memory to share with you from her childhood. This daddy daughter childhood snapshot brings many wonderful memories to mind for Cassandra — as you’ll read below. Every time I see this picture, I smile from ear to ear. That is me, in the red shirt and black shorts…no, not the salt and pepper haired stud, the little cutie with the black bobbed hair! It’s as if I am saying “this is MY daddy”! In fact, I know I was thinking that. If you couldn’t tell by our ridiculously fabulous matching outfits, I was pretty mesmerized by my daddy and I’m pretty sure he thought I was something awfully special. My dad owned a body shop and I loved going to work with him. I remember all the mechanics and body men treating me like royalty. They would buy me candy from the candy machines, bring me fun trinkets and give me “jobs” so they could pay me money. I was a princess in real form but my best memories were when my dad was home from work and he was all ours. We had a nice, large yard most of my life and my dad always took good care of it. My family and I spent many spring and summer evenings in the yard, picking up sticks, mowing, pulling weeds and playing in the sprinklers! I can’t be for sure but I figure this was one of those times. I can still smell the scent of freshly cut grass and hear the sounds of the lawn mower as I watched daddy ride past me. This picture was before my brother came along to steal the show, so it was just me, my sister and mom and dad. I’m betting some time before or after this picture I sat on my dad’s lap as we made each turn through the grass cutting those perfect lines that make every home owner proud! He would let me steer but I had no idea he was really doing the steering. I’m sure after this picture dad grilled some steaks and chicken, and of course we had corn freshly shucked by mom! My daddy loved steak, and I loved steak because he loved steak! Just like I loved my red shirt and black shorts …just like daddy’s! I was a girly girl to the max, but who needs a fancy dress when you can match your #1 hero? Do you have an all time favorite family snapshot? Maybe a similar daddy daughter photo even? One that brings many fond memories flooding back, like Cassandra’s daddy daughter duo does for her? I know I have a few daddy daughter snapshots from my own childhood that bring back many fond memories. Every girl, every woman, has a special place in her heart for her daddy. What is your favorite daddy daughter memory? I’d love to hear from you in the comments below! As the weeks wind down and my second son’s birth looms ever nearer, I thought it was fitting to share this image from my family archives. It’s of me as a newborn in the hospital, with both my grandmothers. I’ve written about one of them so far (Legacy of a Truly Excellent Woman), but both were a big part of my life while I was growing up. This photo is meaningful for me even though I don’t remember that moment. I see my grandmothers as I remember them in childhood — loving, caring, warm and comforting. I remember the soft texture of my paternal grandmother’s hands, the silky smooth wrinkled fingers that floated over piano keys. I recall the vibrant smiles that both grandmothers frequently flashed — a conveyance of their inner joy. I wasn’t the first grandchild for either of my grandmothers. But still I was loved. They were proud of all their grandchildren, eager to hear our stories and listen to our childlike chatter. Both teachers, my grandmothers instructed me when I was older — one piano, the other English. It’s interesting what things you recall when looking at a simple snapshot. How the memories flow, disjointed at times, but all the while bringing back fond memories that make the distance of time seem less far. We were, and still are, blessed to have most of our family nearby. And by that, I mean within 10 minutes by car. Both sets of my grandparents lived 10 minutes away from my childhood home. And now that I’m married with kid(s), we are likewise blessed to have both sets of parents within 10 minutes of our house. And then when you add in aunts, uncles, and cousins, the map of nearby relatives gets ever more crowded. But crowded in a good way. Family is important to us; my husband and I were very intentional in settling down near family. We didn’t want our future children to grow up not knowing their extended family. And I can say that so far, we’ve managed to fulfill that desire for family bonding. Our son knows the street names where his grandparents live, he talks about his cousins all the time, and loves to call on the phone to “invite” family members over to play with him. One of my nieces, though, lives multiple states away. I haven’t met her yet, even though she is almost a year old. My parents are long-distance grandparents to their second grandchild. It’s tough being distant when you want to be close. I often hear a tinge of sorrow in my mom’s voice when she talks, excitedly, about her granddaughter — my niece. Thankfully, technology has helped somewhat with long distance grandparenting. There are video conferencing options like skype and facetime. Facebook allows distant family members to keep up to date with the daily antics of little ones as they grow. Video Chat – use video calls to chat with your grandkids. You could even set a weekly phone date! Send postcards – kids of all ages love to get real, old-fashioned mail. My toddler is thrilled to receive simple postcards when his grandparents are on vacation. Compile care packages – even if the goodies aren’t all that fancy, kids love to get packages. You could probably acquire some finds at the dollar store for younger kids. You could do care packages seasonally, or make themed holiday care packages! Share photos – even a toddler can recognize their grandparents in photos. Send them pictures of you so that your grandkids can talk about what you’re doing and “relate” to you. It doesn’t matter whether you choose to send cell phone pictures or prints. Visit ….but respect boundaries – it’s important to respect your child’s wishes, so make sure to ask and approve any trips before planning an impromptu vacation to visit your grandkids. Celebrate birthdays – even if you can’t be there in person, you can always send a card (or if you’re more ambitious, a present). Again, back to the whole “kids love getting stuff in the mail” thing. Make audiotapes – read your favorite stories aloud so that your grandchildren can listen to the recordings whenever they need grandma or grandpa time. And this next tip is for parents. Talk about distant relatives with your children! Repetition and visual references will help your children to be familiar with their long distance grandparents, great-grandparents, or other far-off relatives. Even though my grandfather (memories of painting with Grandpa) lives a plane flight away, our son knows his great-grandfather, and recognizes him through photos, and fondly remembers the activities they did together two Christmases ago. Here are some resources for those faced with long distance grandparenting. Links will open in a new window for your convenience. How Do You Cultivate Closeness? What tips do you have for those with relatives who live out of state? Are there ways you’ve managed to encourage close relationships between your immediate family and your far-off family? Parenthood has brought new considerations for us, such as the need to prepare a will and ensure that our child(ren) will be taken care for. It seems like the older you get, the more you have to think about end of life preparations. I’ve touched on this before when considering the legacy my grandmother left behind, and the fact that life is too short to put off doing what really matters. Today I’m guest posting over at The Entwife’s Journal about getting your affairs in order — from the perspective of a grandchild (Read Aging Parents: End of Life Preparations). My grandfather is in good health but had decided to set his affairs in order recently. Our son is fortunate enough to know and remember his great grandfather (“grandpa with the broken cane”); I’ve written about my childhood memories of painting with grandpa as well. While I wasn’t directly involved with his end of life preparations, but my mother and aunt helped him organize his estate and complete some necessary end of life planning. Their checklist of things to do included organizing financial paperwork, making sure that both children knew where important documents and valuables were stored, and knowing who would do what when the time comes. End of life planning doesn’t sound fun, but honestly I think it can be bring peace of mind for all involved. Having been through a number of estate distributions, I can tell you that when a loved one has taken the time to put their affairs in order and has taken the time to do end of life planning, things go much more smoothly for the surviving family members. And it is generally less stressful too! I’ve compiled an end of life planning board on Pinterest, with a number of articles and documents that may be helpful if you’re not sure what to do so far as putting together your will, making estate plans, or even organizing important financial documents. Obviously the best choice will be to consult with your lawyer or financial planner, but for those of you who like to do extra research — here you go! Follow Betsy @ BPhotoArt.com’s board End of Life Planning on Pinterest. What about you? Do you have any suggestions for end of life planning made easy? Stories of aging gracefully and being prepared for the final stages of life? I’d love to hear from you in the comments below. I love designing baby’s first year photo albums! It’s always so neat to see the developmental stages and age progression of a child through their first year of life. When I design albums, I like to keep things simple so that the portraits can be the main focus of the album (see album page designs later on in this post!). What Kind of Album For Baby’s First Year? This is a really personal question. Most parents I know end up with a couple different first year photo albums. For instance, we have one album containing the professional portraits, plus another “boxed” set of books that holds snapshots — one book for each of the first three years for our son. When designing albums for my clients, I’ve found many prefer to have a series of albums, one for each of the baby’s first year sessions (i.e. newborn, 3 months, 6 months, 9 months, and 1 year). It’s really neat to have a set of coffeetable albums that you can display in the nursery (see also my post on Displaying Baby Photos in Your Home). Sometimes we’ll do an album for the newborn session, then another for the next three sessions, and a final one for the one year session. It really depends on what the parents want. And finally, here’s another family who chose to do a series of albums, one for each of the sessions their child had throughout the first year of life. Her toddler portraits, taken at one year of age, show just how much little ones grow …and how quickly they grow up! These images below are a sampling from her sessions, which spanned from birth through the first year, plus an additional session at two years of age. I love how her albums turned out — what a great keepsake! My final thoughts on creating an album for baby’s first year? Make sure to include the whole family. Some of my favorite photos, both personally and for my clients, are the ones that include not just baby, but siblings and parents. It is another way to document your family from generation to generation (see what I mean by looking at the family’s separate newborn session: baby Ridge’s newborn portraits). Here are some family portraits that did a great job of documenting a new addition to the family. Albums don’t have to exclude family members to be a “true” baby’s first year album. In fact, I prefer albums that include the whole family… and if you ask my toddler, I’m sure he will tell you that he likes looking at all the photos with his family in them too. Here are some posts about celebrating baby’s first year. Links will open in a new window for your convenience. 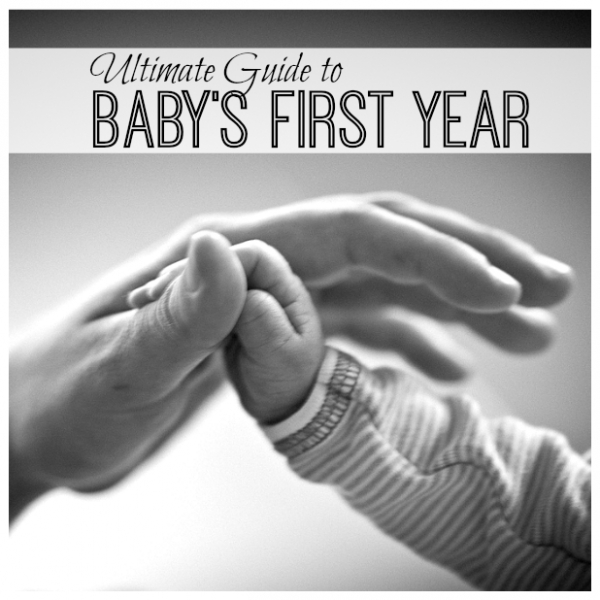 Check out the The Ultimate Guide to Baby’s First Year for a list of all the posts on each topic. I really love documenting family memories. And while it is fantastic to plan outdoor sessions with a relaxed feel, there’s something to be said for the more “formal” generational family portraits. Keep in mind, I don’t mean stiff and overly posed. I’m talking about extended family portraits which span generations. For this generational family portrait session, I helped plan a lovely series of images in studio. Coordinating 16 people for a portrait can be complicated, but fortunately for my clients, it comes easily to me! This family was really a pleasure to work with and create portraits for. Everyone was so cheerful and laid back, I didn’t have much to do in terms of helping them relax for the portraits! It’s always great when personalities shine through — especially in photographs, don’t you think? At the end of this post, I’ll share some tips for documenting generational family portraits and important milestones (like new additions to the family). First, let me share these lovely family portraits with you. Here’s the complete generational family portrait, with all the extended family groupings included. I love images like this that span multiple generations. Besides, they’re great for documenting a growing family as well (see the adorable new baby!!). Whenever I plan an extended family portrait, I ALWAYS recommend doing smaller family group portraits as well. Why? Well, because I have everyone in one place. That’s usually tricky to do, right? Everyone is in different places at the same time because of schedules. It’s best to take advantage of the opportunity when it presents itself. Plus, this way I can offer my clients a lovely portrait to pair with the main generational family portrait when it comes time to creating wall displays. These smaller family portraits are going to look great on the wall next to the generational family portrait! Another portrait that I highly encourage is one of the grandparents, like this portrait below. In organizing my own personal family photographs, I’ve noticed that as a couple grows older together, they become more focused on having professional portraits to document their children and grandchildren rather than themselves. I totally get this. But, all the same, kids and grandkids appreciate having the portraits to document how they remember their grandparents. So don’t forget to include this portrait in your next generational family portrait session. Another cute one along these lines, if you have reluctant grandparents is to do a portrait with grandparents and grandkids all together. What grandparent doesn’t want to have a portrait of them with their grandchildren, right? And here are some more portraits of the smaller family groupings. I don’t think I’ve mentioned clothing yet — but notice everyone is NOT wearing the same color. Sometimes my clients want matching outfits, and I’m happy to do so. But, choosing outfits in complimentary tones works really well visually while still preserving a sense of individuality. I love the shades of gray, white, and black in this image …and denim jeans usually go well with everything too. As promised, here are some suggestions for when you plan your generational family portrait. I typically go over this sort of thing in more detail during the planning stage of a portrait session, so don’t get overwhelmed thinking you have to have all these things decided ahead of time. It’s my job to help guide my clients in the right direction. Where will your family portrait be? I’ve planned portraits in the studio, at clients’ homes, or even at a location outdoors that has special meaning for that family. My favorite generational family portrait on location? It was done at the family’s farm house that had been passed down through generations. What will you wear? Make sure to plan your attire so that it will work for your family. You don’t want people feeling uncomfortable or stiff because of the clothes they’re in. I’d much rather plan a more relaxed generational family portrait with casual clothing if it means that everyone will be relaxed and interact cheerfully for the the camera! What about pets? Sometimes there are family pets that need to be included too. I’m happy to accommodate these requests, but it does help me to know ahead of time whether that pet is a lap dog …or a horse. So, don’t feel like you have to exclude your animals from the portraits — they’re a part of the family too, after all! Here are some resources if you’re interested in documenting or researching for family’s history. It can be fun for kids to learn from their elders by “interviewing” them about what it was like growing up — whether it is 20 or 50 years ago, the differences are still amazing. Links will open in a new window for your convenience. (Also, check out my Family History + Genealogy Pinterest board). Follow Betsy @ BPhotoArt.com’s board Family History + Genealogy on Pinterest. What are your favorite family memories? Are there photographs you treasure because they capture a moment in your family’s history as you remember it from childhood? Do you have generational family portraits that are special to you? Or maybe you don’t have many photographs from your family history… does this make you feel a more urgent need to document your own family’s milestones and memories? As always, I welcome your comments, thoughts, ideas… and if you are looking to plan a professional family portrait, I would be more than happy to talk with you about how we can best document your family through photographs. Today I am sharing a poem in memory of a truly excellent woman, my grandmother – Fayola Ash. I wrote this in memory of her passing, which was almost three years ago — on my son’s due date (3/15/2011). He arrived about two weeks later, in good health — and he was known by name to my grandmother before she died. If you want to read the backstory behind the poem, consider some thoughts on creating a photographic legacy, and view more candid photographs, make sure to read to the end. She had a firm foundation. She knew what she believed, and did accordingly. Her whole life was a testament to her Creator. he let her have the final say. as her fingers danced across the keys. Age slowed them down, but didn’t stop her. on her lips, even as death approached. She lived a life worth living. But in the end, cancer struck. the finality of the battle. In her dying hours, she was selfess. She always wanted the best for others. Even at the sacrifice of herself. Small in stature, she left big shoes to fill. that one day I will fill my grandmother’s shoes. She was a truly excellent woman. This section does talk about my faith and beliefs. If that might offend you, feel free to skip to the next section. It’s just an integral part of who my grandmother was, so I can’t overlook it. The Voice Bible translation describes the Proverbs 31 woman as “a truly excellent woman” (Pr 31:10). This is where I began when writing this poem, as my grandmother was an inspiration to all who knew her. She was everything one would aspire to be as a woman of God. While we never get over the loss of a loved one, it has taken me several years to realize the impact her life has had on me, and how I want to live my life as a wife, mother, and person. I hope that I will one day be able to look back on my life and know that I too, with God’s grace, was able to be a truly excellent woman in all my words and deeds. In 2010, I accompanied my grandmother on a trip to Israel and Italy (she did not want to go alone). At 86, she was not the youngest on the tour, but she was a trooper. She conquered all the stairs at Tel Megiddo, she walked the Via Dolorosa, and climbed aboard a camel. Why the camel ride? She’s always wanted to ride a camel since seeing them on her travels to Egypt with my grandfather (my photographic inspiration). On this trip, she carried his camera with her (yes, I helped her use it from time to time). It was an honor to have taken that trip with her, and I have memories I will always cherish. She was a world traveler, and I got to share in her last big trip abroad. What kind of legacy will you leave? What do you hope to accomplish in your life? What will the photographs say about you to future generations? I know I tend to ask a lot of open-ended questions, and I don’t pretend to have all the answers either. I know what matters to me… yet I make new discoveries on that front every day. I hope you too will be inspired to take an active role in crafting your legacy. The decisions we make today, the actions we take now, all affect the person we will be remembered as by future generations. And if you haven’t checked it out already, make sure to read my post, Life is Too Short, which I wrote earlier this month as I grieved with my friend for their loss of a family member. Pregnancy does things to ramp up emotions, so maybe that’s part of the reason for these sentimental posts. But truthfully, sentimental is part of what I do for a living. I make memories for my clients, I create portraits that capture personalities, I help document family legacies. I love doing multi-generational portraits because, for me, family is really what it’s all about. So, back to my question: what about your legacy? Do you have someone similar to my grandmother, a truly excellent woman, in your life? Will you be an inspiration to others, as my grandfather inspired me to become a photographer? Will you be known as a someone whose shoes others can only hope to fill? Happy 50th anniversary to my wonderful in-laws! We will be helping them celebrate this weekend. It is always wonderful when I can be a part of welcoming a new family member. Sometimes my clients bring in tiny newborns, and sometimes life is so crazy that I get to meet the babies when they are a couple months old. Either way, I love creating these family portraits because the portraits are a celebration of change and growth — family growth! Here are some portraits from a recent family session. We created a whole range of portraits, including both family groupings and individual newborn-esque portraits. I love sessions like this! Over the holidays, and we managed to plan an impromptu family portrait. I was thrilled, as I always emphasize the importance of images like this to my clients, but haven’t been able to coordinate one for my own family since before our little one joined the family. I am so glad we were able to capture this portrait of myself, my son, my mother, and my grandfather. Timing constraints didn’t allow us to include more family members, but I am confident we can plan something for the next family get together. This portrait is already hanging on the wall in our kitchen, where I have been able to enjoy it on a daily basis. I love doing birthday pictures that include cake, cupcakes, or some sort of treat for a toddler. And this session was no exception. And after a little cajoling, we finally got a bit messy! Sadly, I think we got more icing on the floor and on the adults than on the toddler… go figure (guess Baby Led Solids/Weaning really does work). This summer we did a fun family portrait session in Chelsea! It included three generations of family members, and at the end, all the kids got to jump on the trampoline for the camera. The SB family commissioned me to do an extended family portrait late this summer. Their flower gardens were in full bloom, and everyone, including Chili the dog, did a great job of sitting for this series of family pictures. It’s always lovely to do portraits like this, particularly when you can include three generations in the family picture. While the weather was warm… it was also beautiful… and we ended up with some beautiful family portraits for the SB family to display in the stairway of their home, among other places! The H. family had everyone in town over the holidays, and of course they contacted us to plan a portrait session at their home! We kept things simple, since the entire family group was so large. It takes some time to create a family portrait like this, so we did have to tease a few smiles out of the kids for some of the portraits. Overall I was really pleased with how well everyone did, particularly the puppy and the children. The important thing is that everyone had a relaxed experience, and that the portraits turned out well. I’m sure the H. family will enjoy these family portraits for many years to come. This summer, Linda planned a four generation family portrait! We decided to create the family portrait at her mother’s farmhouse near Chelsea. And I think the results are absolutely priceless. We actually created two separate portraits — one with four generations of women (Linda, her mom, one of Linda’s daughters, and her granddaughter), and the other with three generations (Linda, her mom, and Linda’s other daughter). I love doing family portraits on location like this! Creating a family portrait in my clients’ homes is not only a more relaxing environment, but the family portrait ends up being more meaningful because of the setting! While going outdoors wasn’t really an option in the middle of winter (way too cold!) — there are plenty of places that make great settings for portraits. This great room setting turned out perfectly, especially for the extended family portrait. When we create a family portrait with an extended family grouping, I always recommend creating the smaller family portraits as well. I’m really thrilled with how these family portraits turned out — and I know the portraits will make a wonderful addition to Allen and Michelle’s home.